As you may have noticed, a depressing fatalism has infected the national convers ation about gun control. Despite wall-to-wall coverage of horrific mass shooting after horrific mass shooting, it’s acknowledged, among people who follow this stuff closely, that our lawmakers are unlikely to address this issue in any substantive way. Which poses a problem: How many times can you say the same thing over and over again? How many times can you repeat the fact that most other Western countries don’t give gun buyers the free pass that we do, and they all seem to have lower rates of gun violence than us? It’s easy to repeat yourself. Which poses an interesting question for someone like me, who is interested in the potential of video games to tell stories in different ways, to elicit feelings other media can’t. 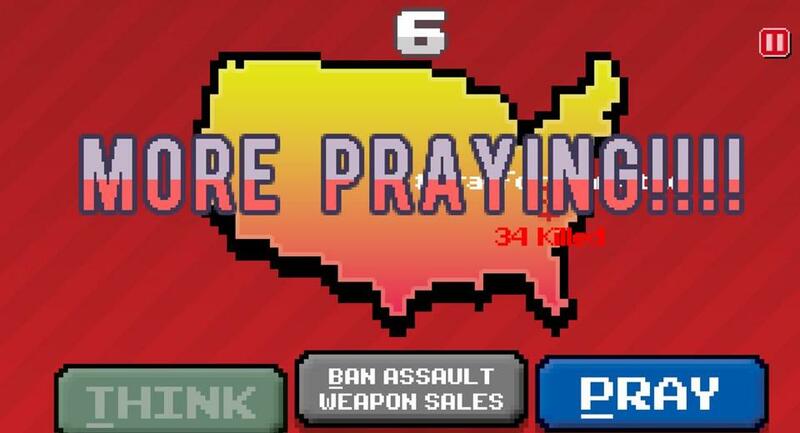 Take “Thoughts & Prayers: The Game,” a simple browser game you can play for free, in 30 seconds, from www.thoughtsandprayersthegame.com. It was created by an outfit called “GOP Arcade” that seems to specialize in liberal, politics-infused browser games. The only “gameplay” options are presented at the bottom of the screen: hit T to send your thoughts, hit P to send your prayers. So you alternate: a thought, then a prayer, then a thought, then a prayer. After a few seconds a third option pops up: hit ‘B’ to “Ban Assault Weapons Sales.” Only, no dice: When you hit that key you get messages like “That’s UnAmerican!” or “You depend on NRA donations” or “You don’t have the votes!” In other words, it’s impossible — all you can do is continue to think and pray, think and pray, endlessly and futilely, forever. At the end of this very short game, your “score” appears: “Great job!” the game tells you. It then lists the number of thoughts and prayers you’ve racked up — whatever the sum of the two is, as well as your number of “Lives Saved.” That latter value is always — you guessed it — zero. Is this the deepest, most sophisticated statement about gun violence and political dysfunction ever? Of course not. But something works so well about “Thoughts & Prayers,” how pounding the keyboard to no avail exacerbates the feeling of futility, as the game spews out endless, pointless thoughts and prayers while the national body count rises inexorably. I’m not sure any medium could have pulled off exactly that perspective on the sadness and anger inherent to this whole debate. That’s what I’m interested in, and that’s where I feel like gaming hasn’t reached its potential. How can games bring out feelings that the rest of our tired, endlessly combative discourse can’t? How can it create new angles when it feels like every angle has been covered? If a simple browser game can pull this off in 30 seconds, in other words, are we anywhere close to realizing this medium’s potential?